The small picturesque village of Sur En is situated on the River Inn, as the name suggests (Sur = on, En = Inn). Once you have crossed the wooden bridge over the River Inn, you have almost reached the Sur En campsite and thus one of the different places to stay in Sur En. Those who value a higher level of comfort can stay in one of the holiday apartments, guest rooms, the hostel or the hotel. Life is never boring in Sur En. During a walk through the woods you can marvel at more than 100 pieces of art in situ on the Sculpture Trail. For one week in June during the International Sculptors’ Symposium, organised by Art Engiadina, you can watch the sculptures being made. In the Rope Park, you get the chance to experience a view of the forest from the tree tops. 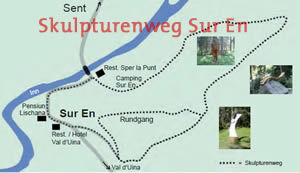 The natural environment surrounding Sur En offers breath-taking views and is ideal for extensive walks. In winter you can skate through the romantic snow-covered forest, marvel at Art Engiadina’s winter project or practise Alpine curling. Come and see the beauty of Sur Ens for yourself. We look forward to welcoming you!